A man has been given a suspended prison sentence and banned from driving for two years after admitting being involved in a road rage incident on the A14 at Bury St Edmunds. The actions of Kristopher Cambridge, 36, resulted in the eastbound carriageway being closed for five hours at the start of a Bank Holiday weekend. 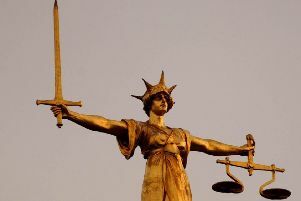 Today, Ipswich Crown Court heard how Cambridge, of Broomdean Avenue, Birmingham, braked hard and almost stopped his Vauxhall Astra after another driver pulled out in front of him. The court was told that, as a result, two lorries and another vehicle which were behind Cambridge suffered ‘significant’ damage and the road had to be closed, leading to long tailbacks. Cambridge, who has no previous convictions, pleaded guilty to dangerous driving on April 28 last year. Judge John Devaux sentenced him to six months imprisonment suspended for 18 months, disqualified him from driving for two years and ordered Cambridge to complete 120 hours of unpaid community work. Describing it as a road rage incident, Judge Devaux said it was only through ‘sheer luck’ that no-one had been seriously injured. The situation had been made more serious because Cambridge’s wife and daughter were in the car. Appearing for Cambridge, Andrew Thompson said his client, who had been travelling to Ipswich, was remorseful. Cambridge had become upset because he believed the driver of the car which pulled in front had been tailgating him.